This volume looks into the advantages and the challenges in applying commercial information technologies in coalition and emergency operations. The articles discuss the many roles of IT in the security sector in general, with a particular focus on medical services and the provision of emergency and disaster relief. Among the themes addressed are the development of architectures and the IT infrastructure of command and control, the use of web services, information sharing and communication security in ad-hoc coalitions. Wallmark, Magnus. "Interoperability between Agencies and Nations." Information & Security: An International Journal 16 (2005): 5-9. Graschew, Georgi, Peter M. Schlag, Theo A. Roelofs, Stefan Rakowsky, Wolfgang Düsel, Uwe Müller, and Andreas Lieber. "Telemedical Services for Disaster Emergencies." Information & Security: An International Journal 16 (2005): 62-76. Monitor, ISIJ. "Fourth International Workshop on Commercial Information Technology for Military Operation." Information & Security: An International Journal 16 (2005): 128-129. Monitor, ISIJ. 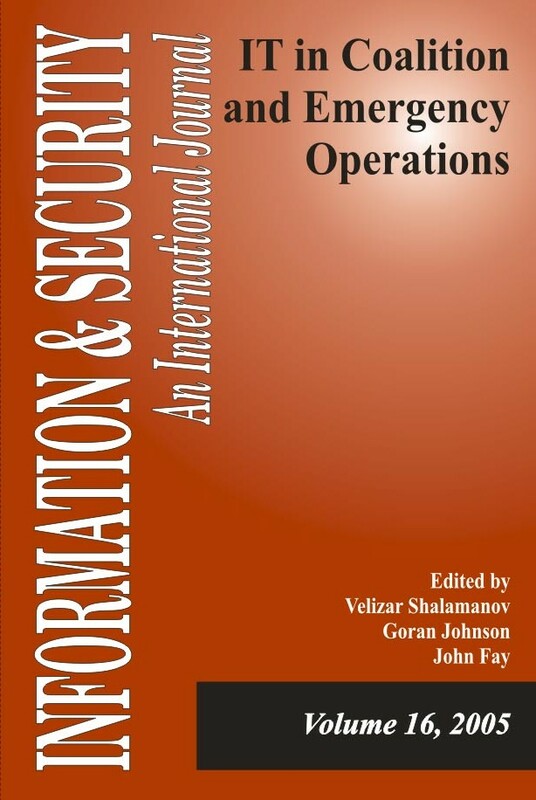 "Operations Research Support to Force and Operations Planning in the New Security Environment." Information & Security: An International Journal 16 (2005): 130-131. Monitor, ISIJ. "Black Sea Initiative Project for Civil Military Emergency Planning." Information & Security: An International Journal 16 (2005): 132. Monitor, ISIJ. "The White Paper of Civil Protection of the Republic of Bulgaria." Information & Security: An International Journal 16 (2005): 133-134.